Does Your Room Need a Bigger Rug? 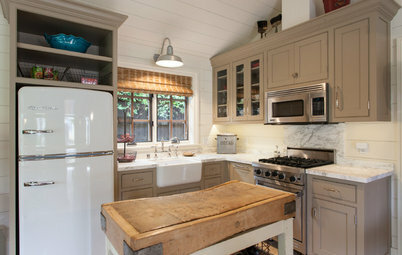 Houzz UK Contributor. I'm a freelance writer and sub-editor with more than 15 years' experience in publishing, and have worked on a wide range of titles including Ideal Home, House Beautiful and Marie Claire. 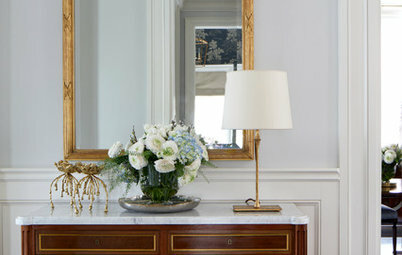 I'm obsessed with interiors and delighted to be part of the Houzz team. 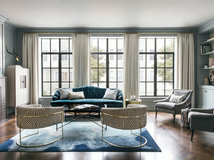 Most of us probably agree that a room without a rug can feel unfinished, and most of us probably veer to the standard just-larger-than-the-coffee-table size. But are we missing out by thinking small? These rooms with oversize rugs prove that big is beautiful and useful. Luxe feel. 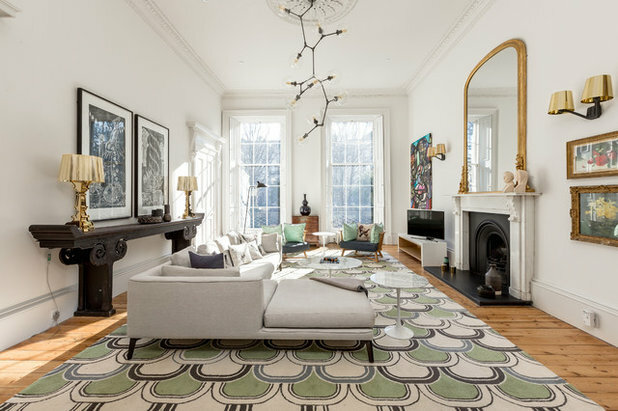 The sheer scale of a large rug brings a sense of decadence to a space. 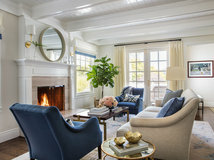 And, as this lovely living room illustrates, an oversize rug shouldn’t be restricted to big areas. 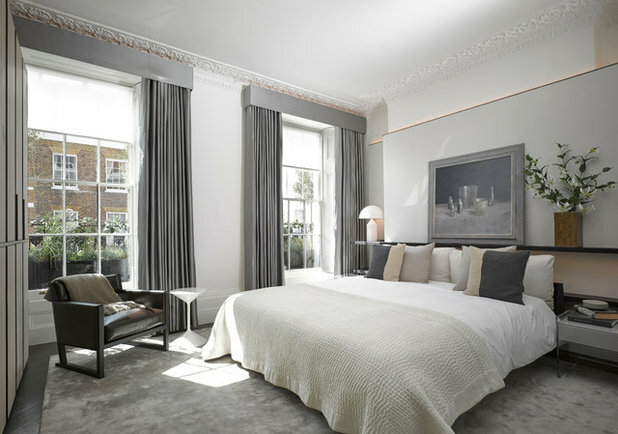 In fact, where a little rug might make a room feel choppy and therefore small, a large design will have the opposite effect. Moreover, think how a rug like this will protect you from floorboard drafts in the winter. Bliss. Don’t want to hide the entire wood floor? This custom supersize rug lets the floorboards shine too. If you’re having a design made, use masking tape to map out the ideal size and to make sure your furniture will fit on it. Life for dead space. 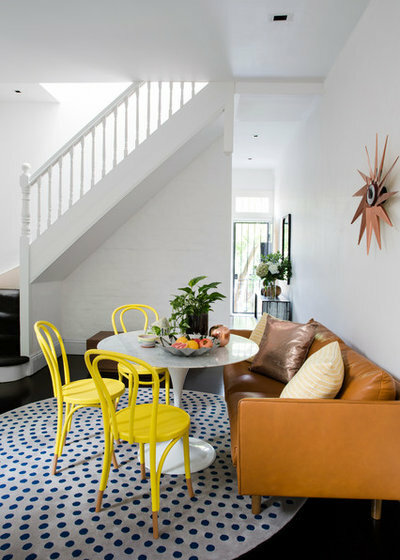 Yes, the long leather sofa, pedestal table and look-at-us yellow bentwood chairs are the big players in this hallway hangout, but without the sizable round rug, the whole setup would seem lost and not anchored. The choice of a circular design to match the table gets extra style points. 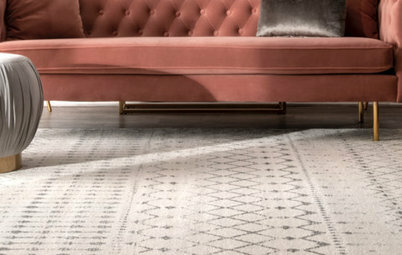 In a high-traffic area like an entrance hall, rugs should ideally be secured with a nonslip rug pad. The pad also helps the rug stay neat, without any folds. 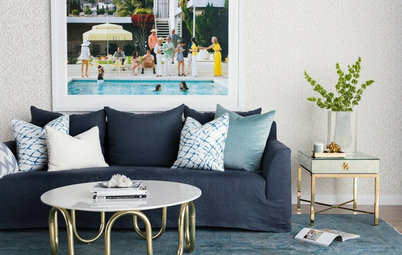 Perhaps you like the look of a large rug, but you are renting and worried about buying one that fits in your current home but won’t fit in your next place. Layering can come into play in this scenario. Here, two average-size rugs put together give the luxe look of an oversize rug. 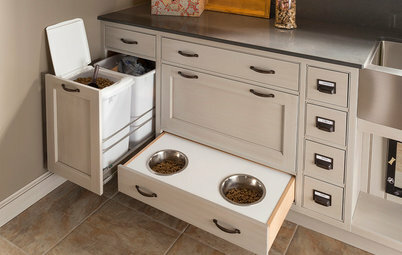 When you move, you have the option of using these together or in different rooms. Carpet protection. Inherited an easy-to-stain pale carpet in your living space? Or perhaps you put one down before kids came along? 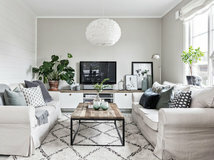 You can keep the carpet (and the space-enhancing neutral look it brings) by teaming it with a large floor covering in a more forgiving neutral shade. This flat-pile gray rug is a smart choice since it hides a multitude of sins and shakes off dirt easily. 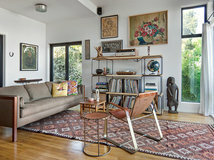 Plus, the addition of a second rug brings a cozy, bohemian feel to the space. 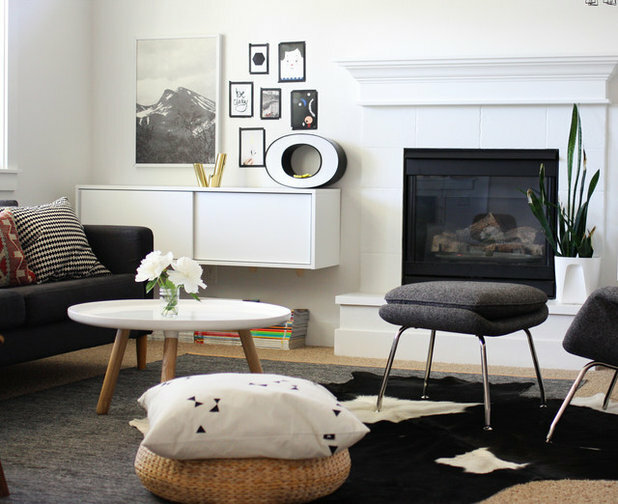 The top rug is less likely to move about with the base rug to keep it in place. Zoning aid. 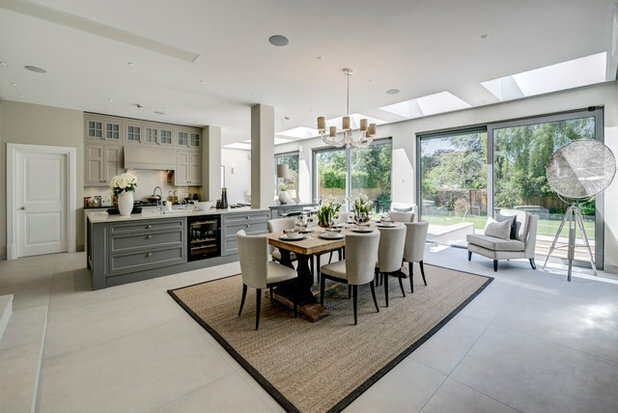 Extra-big rugs are also ideal for breaking up a large open-plan space like this one. 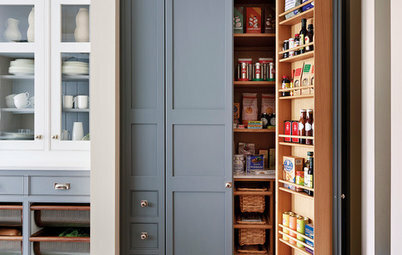 In a room that functions as a living, dining and even cooking space, a rug can mark out each area. Before you buy, make sure the rug for the dining area is large enough for the chairs to be pulled back and still remain on the rug. This means that if you have wood floors, they’re protected from scratches caused by the chairs. 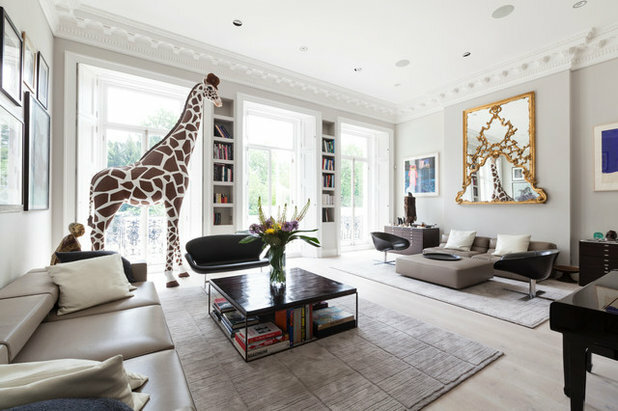 This living room is big — just look at that life-size giraffe! In a similar vein to the previous room, large rugs can be used for creating more intimate zones in a generous living space. Here, two rugs help form two distinct seating areas, which in turn make this grand room feel a little less imposing. 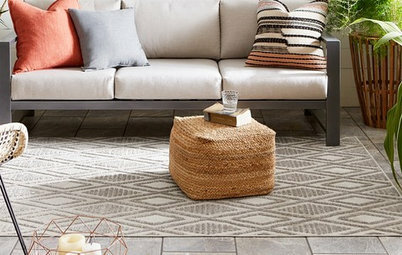 If you go for neutral rugs like these, a shoes-off policy might be in order. You’ll also want to vacuum the rugs often to keep stray grit from becoming embedded, and a professional clean every year is advisable. Another handy tip? 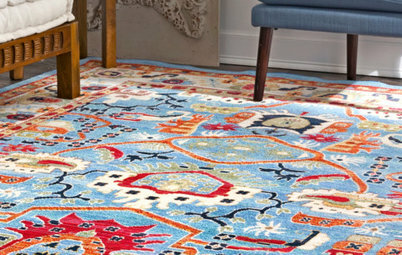 Rotate your rug (or rugs) every six months so that wear from footfall and fading from the sun aren’t concentrated in one area. Best of both worlds. Carpet? Wood floor? 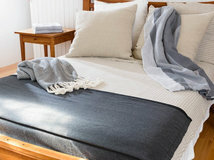 Why agonize over which option to go for in a bedroom when you can have the benefits of both by opting for an oversize rug. You’ll have the advantage of stepping out on a warm, soft surface in the morning, plus you’ll get the natural beauty a wood floor brings. Other benefits? There’s the small matter of soundproofing. The rug absorbs sound to muffle the pitter-patter of feet. 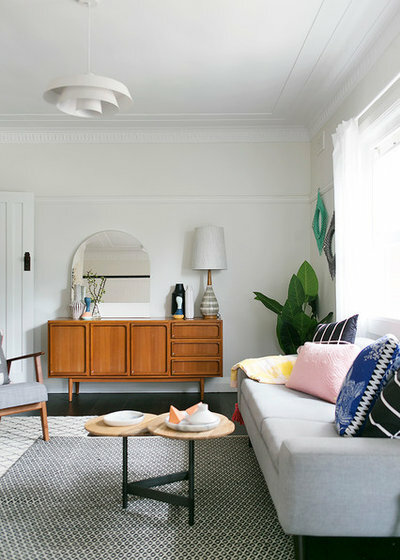 Share: Did you opt for an oversize rug? Tell us about it or upload a photo in the Comments. Rugs capture dirt and allergens too right? Is everyone taking their rugs out and having them cleaned weekly? Certainly not if they are oversized? I do not have allergies myself, and I certainly believe that all of you that suffer from them know what works best for you. 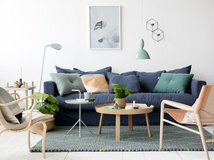 Online, I have read references to studies from Germany, Sweden, and other parts of Europe, that suggest air quality is improved by carpet "trapping" allergens, until they are regularly removed through vacuuming with HEPA filters, and twice yearly water extraction. The results suggest that tile and hardwood surfaces actually allow the allergens to kick up into the air each time a door is opened or someone walks across the room. This seemed to make sense to me; but as I said, I have never had allergies--maybe all of those studies were funded by Carpet Manufacturers? Here is a link to a blog that references a few studies. Could carpet improve asthma/allergy symptoms? For myself, I love the look and longevity of wood/tile floors and have them in kitchen, baths, entry points, and laundry room. But, I love the warmth and softness of carpet even more. I chose a tight-weave, quality, loop carpet for the rest of our home, and follow all cleaning guidelines. I also lucked out by moving to Utah where dust-mites have a hard time surviving because of the arid climate :) Best to you all, I do enjoy the opportunity to learn from your insights and experience. Well, as with most things, it's a matter of preference. I do agree with the article: in most cases larger rugs are better, and smaller ones look like someone tried but couldn't quite get it right. The rest (tile vs. hardwood floors vs carpet) is up to style and personal taste, as well as health, esp. for allergy sufferers. 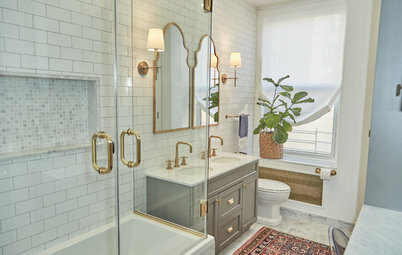 When we bought our first "nice" house years ago, which had only wood floors on the first floor (with the exception of tiled bathrooms) my husband so loved them and wanted to show them that we had only a couple of area rugs. He insisted on having wtw carpet in the bedroom because "his toes needed to feel something warm" when he got up; I tried to convince him to use area rugs on hardwoods instead, but did not succeed. After a while in the house we realized that A. the house looked and felt a bit cold and not quite "permanent" without area rugs, and B. hardwood floors quickly show wear just from wearing shoes etc, let alone kids and their friends running through the house etc. Also: the wtw carpet in the master bedroom did not stay so nice and light for very long, and pets love messing up right in the middle of a nice carpet. (Our first cat hardly ever had "hair balls", but number 2 and 3 did all the time!) Lessons learned? A. Area rugs add much style and comfort to tile and hardwood floors (esp. tile because it looks and feels so cold), plus they protect nice wood floors while still allowing them to show all around. B. Area rugs, esp. patterned rugs, are easier to spot clean than wtw carpet, so if you have pets it's wise to choose something with a short pile....the same goes for bound pieces of wtw carpet, which is a great option if one doesn't want to spend a ton of money or can't quite decide on a nice, patterned area rug or likes to change looks every few years. 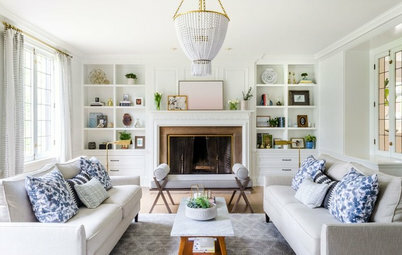 This way we can sort of have the best of both worlds and enjoy a bit of everything, and it DOES work well, even if at first thought it may seem counterproductive to install nice wood or tile floors only to cover up sections of them.